You must be a member of the Wolfsburg Out & About Group to attend this activity. Would you like to join this group? We should be met at 10:30 in Ilsenburg Hbf and start our hike towards to Plessenburg. After a short brake we continue to Steinernen Renne, the nice Gästhaus exactly at the end of the valley. 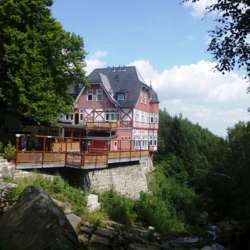 We should enjoy our lunch there and then we start going downwards to Wernigerode through the nice valley. The total hike is about 14km and the estimated time is about 5 hrs.